Earth’s orbit is chock full of junk, from pieces of smashed satellites to tools lost during spacewalks. NASA is currently tracking more than half a million pieces of space debris, many of which are traveling fast enough to do some serious damage to spacecraft. Over 20,000 of them are larger than a softball. SpaceX’s Starlink project — the launch of close to 12,000 communication satellites to bring internet broadband to the entire planet — seems likely to contribute to that problem. But the Verge reports that SpaceX might have a solution: fly more than 1,500 Starlink satellites at half the originally planned altitude of 1,110 km (690 miles). In a filing to the FCC, SpaceX argues that the advantages are twofold. 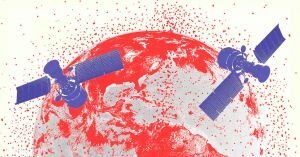 First, its satellites will be orbiting out of the harm of the majority of existing space debris. Second, orbiting at 550 km (342 miles) will make the satellites far easier to retire once their days are up — and according to NASA, that will happen on average after only five years in orbit. At that altitude, the Earth’s atmosphere will dispose of SpaceX’s trash automatically by slowly pushing the satellites out of orbit. It’s great that SpaceX is thinking of the consequences of adding to an already significant space junk problem ahead of time. Sending up satellites only to have them be obliterated by existing space debris is bad news for everybody — especially if you’re staying on the International Space Station.